Nevertheless, when they’re in class with their teacher, they’re not allowed to speak Spanish or Arabic or Ewondo. They are all expected to speak only French. This is Quebec, after all, and their class is a classe de francisation or classe d’accueil—translated as welcome class. At École des Cinq-Continents, an elementary school in Montreal’s Côte-des-Neiges neighbourhood, Manon Dubreuil has taught welcome classes at various grade levels for 20 years. Students can be admitted to the welcome class at any point in the school year, Dubreuil said. “Normally, they stay in the class for 10 months, and those who need it can stay another 10 months,” she added. Dubreuil, who also teaches and supervises student teachers at the Université du Québec à Montréal, said her biggest challenge is preventing students from speaking their mother tongues in class. Quebec’s Charter of the French Language—also known as Bill 101—was passed in 1977 and states that the province’s official language is French. The law requires that children be educated in French until the end of secondary school, whether in a public school or a government-subsidized private school. However, there are exceptions. One involves the granting of a Certificate of Eligibility, primarily to students with a Canadian citizen as a parent or a family member educated in English in Canada. Additionally, there are special and temporary authorizations available for students in extenuating circumstances. Also exempt from Bill 101 are those enrolled in non-subsidized—and generally more expensive—private schools, those who are homeschooled, as well as “Amerind” or Inuit students. But the majority of children and teens who arrive in Quebec as immigrants end up in French public schools. Most of them can already speak French and go straight into regular classes, although some benefit from a little extra help. Those who cannot are placed in classes like Dubreuil’s. In 2012, only about 38 per cent of immigrants arriving in Quebec did not already speak French, down from 49 percent in 2003, according to a recent article in La Presse. This number is expected to continue to fall as the provincial government implements measures favoring immigrants from French-speaking countries like France, Haiti, Algeria and Morocco. As a result, the number of students in welcome classes is also falling. 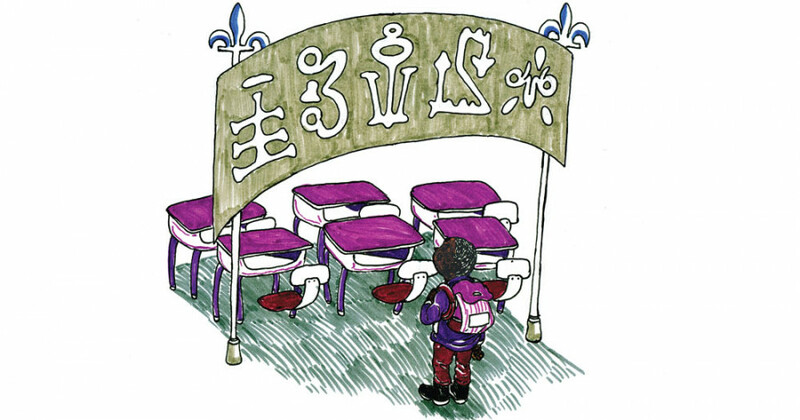 In Montreal elementary schools, 3,856 students were enrolled in welcome classes in 2009-2010, compared to 3,258 in 2011-2012. This last figure represents about three per cent of all Montreal elementary school students. Some have argued that welcome classes do more harm than good, marginalizing new arrivals by labelling them language deficient and isolating them from their mainstream peers. “Well, that’s ridiculous,” said Dubreuil. “That’s completely crazy. They’re not deficient of anything, they’re learning a second language. “Try to imagine spending an entire day in a class in Chinese, with students speaking Chinese. Imagine how exhausted you would be at the end of the day,” she continued. Dubreuil added that welcome class teachers work with regular class teachers to try and help the new students integrate. “If a student in math, for example, is ready to integrate into a regular class, the regular teacher can accept to take them once or twice a week,” she said. Dan Grigore does. He arrived from Romania with his family at the age of 11. After joining the Grade 5 welcome class at his LaSalle elementary school, he started Grade 6 in the mainstream class in September. But what Grigore remembers best, aside from a class field trip to the cabane à sucre, is the friends he made in the welcome class and the support they provided. “Being with kids who are in a similar situation as you, going through the same experiences and learning together at the same level, it helps a lot while you’re being introduced to your new culture, to your new country,” he said. Grigore went on to learn English as a third language and completed a BA in commerce at Concordia in 2009. Looking back, he wonders how things would have been different had he not had the welcome class. “I think if I had been thrown into the regular system without the [welcome class] or without other kids who had similar experiences, maybe I would have been more introverted, or had a lot of trouble making friends,” said Grigore. Not that the welcome classes are without problems. For example, like many teachers in mainstream classes, Dubreuil said that she is seeing more and more students with behavioural and psychological difficulties. But there are other issues unique to the welcome class. She suggested that the diversity of the students’ home environments also presents challenges in the classroom. “These are kids who live a completely different reality at home compared to their peers, because at home they keep their traditions, like their way of eating. “The other problem is parents who don’t speak French, so they don’t necessarily have help with their homework,” Dubreuil added. On the plus side, her welcome classes are significantly smaller than the norm, with a maximum of 18 students. Also, she said that the students are generally more respectful, often coming from cultures that place more value in formal education. “The students get very attached to us,” said Dubreuil. “The welcome teachers have maybe a warmer approach. We have a special link with the children because they get attached to us and we’re their first link to the new society.